I’m new to the RL and I’m hoping to build an Ewok costume. I have a few potential bits for the costume already which I’ll post photos of. One question I did have was how to pad this character out a bit? Would I use some kind of undersuit? Thanks, I look forward to the build. Hi, I'll ask our Ewok expert contact you. Please also check out the Ewok tips further down in this section as well. 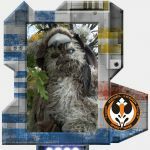 We have a significant contingent of Ewok builders on Facebook's "Chief Chirpa's Army". Come join us! Did a search on Facebook for Chief Chirpa's Army, and didn't get any results. Care to post a link?